I just created a new page for the spoken word CD that I made in 2005, with some newly whistful liner notes. It’s like a tenth anniversary rerelease. Except things no one likes usually don’t get rereleases. The League of Automatic Music Composers 1978-1983. New World Records. The late 1970’s saw huge strides in technology for electronic composition and performance. New software and hardware innovations were blowing up the possibilities for aural exploration and becoming the playground for a generation of experimenters. But a few composers preferred to forego sophisticated instrumentation and continue messing with twenty-year-old circuit boards. Among them was a collective — a more appropriate word than “ensemble” — led by John Bischoff, Tim Perkis, and Jim Horton, with appearances by many others, most notably David Behrman and Rich Gold. The League of Automatic Music Composers sought a lack of control over their electronic works at a time when many composers were tightening the reins. With The League of Automatic Music Composers 1978-1983, recently released by New World Records, the music of this group can be heard by a much wider audience than was previously possible and grasped more clearly in the context of the American avant-garde. To understand the League’s project, it’s useful to consider the state of music in the Bay Area in the 1970’s. Mills College’s reputation in the innovative music world — and its liberal open-studio policy — made it a natural hangout for experimenters of all stripes and a hub for cross-pollination. When classically trained performers met musicians of other idioms — punk rock, jazz, electronica — improvisation became a common unit of exchange. An improvisational dialogue built momentum at Mills, California College of Arts and Crafts, and the New College of California, as well as numerous independent art spaces around San Francisco and Oakland. Behrman, Gold, Bischoff, and Horton — the first iteration of the League — sought to create computerized music with the organic nature of improvisation, a music in which the computers were also improvisers. Such immediacy was not possible with the synthesizer software of the time, so instead they built their own crude networks of microprocessors. In one such network, a computer would play a predetermined melody. A second computer, programmed with a simple just-intonation algorithm, would create harmonies to follow the first. A third would echo the key changes of the second, and the first would speed or slow its tempo to stay in time with the third. Once such a program was arranged, human interaction with the processors was kept to a minimum until a piece had run its course and the League adjusted the arrangement. The League’s performances, informal affairs in and around Mills, would regularly go on for several hours, during which audience members would come and go, talk and ask questions. What I find most remarkable about The League of Automatic Music Composers 1978-1983 is, despite its conceptual loftiness, how utterly listenable the thing is. True, much of it is very difficult, but frequent are the moments when the various elements come together for minutes on end of sheer indulgence. The album deserves a place in the improvised music canon, if only because it captures sessions that humans should be jealous of. According to producer Jon Leidecker’s notes, the 55-minute album began as 40 hours’ worth of tapes, and reading that saddens me a little. Perhaps the brief CD fails to capture the leisureliness of the original performances, but instead it offers a comprehensive yet digestible account of a fascinating moment in experimental music. This week, Daniel Solis started an utterly fascinating discussion on Twitter on the implicit assumptions that people make about how games work. Daniel and most of the participants are game designers. I’m not a game designer, but I love thinking about the unspoken boundaries of an artform or medium. #GameAssumptions The board stays in its current position on the table. #gameassumptions You must be one of the players in order to be eligible to win. And I love how in each of these tweets, there’s a challenge. In defining an assumption of a medium, you implicitly point across the border to the possibility of an object that would subvert that assumption. #GameAssumptions Play is either continuous or discrete. It is not continuous for some and discrete for others. #GameAssumptions The rules are not lying or withholding information from you. #gameassumptions All players will be informed when the game is completed. I’ve always thought that avant garde is sort of a misnomer. Because the rest of the army doesn’t always follow. Avant garde artists continue to work in ways that foreground assumptions and questions about the media in which they’re working. And in at least some mainstream art, the boundaries remain more-or-less invisible. #GameAssumptions Games are meant to be fun. #GameAssumptions The people who are playing know they are playing. Which is not to say that experimental and traditional work cannot coexist or contribute to each other or share an audience or share practitioners. I think one of the main things that define the current state of the poetry world is the swiftness with which the rules jump between the foreground and the background. #GameAssumptions The game will not set you on fire. I really like this blog post by Nina de Jesus (brought to my attention by this discussion on the FC-Discuss list), arguing that the free culture movement often acts in ignorance of the long-time use of its practices by the hip-hop and fan fiction communities. It is this lack of understanding about the serious issues of exploitation and structural inequality that has largely made me apathetic and uninterested in the free culture movement. Since, Gaylor likely thinks he was making a point about artists building on the past, but all I saw was an argument that the cultural products of Black Americans should always be exploitable and profitable for white people. That when Black Americans literally create the very thing the video talks about — digital sampling and remixing — it not only deserves some kind of mention, but that the revolution, and the reasons why it happened, will be lost to history (by this I mean racial oppression, poverty, the ghettoization of Black Americans, the prison industrial complex, the war on drugs, etc, etc). It sets up a general perception that mashups are for freedom, while “gangster” rap is essentially just low-brow, commodified corporate culture. There are certain perennial stories we hear again and again in discussions of how copyright law stifles innovation. (The Breakfast Club music videos come immediately to mind.) And many of these stories feel too safe – white people want to consume mass-produced culture more creatively! What if we spent more time talking about disempowered cultures that find themselves in direct opposition to the companies with the strongest influence on copyright law? Girl Talk has never been sued because he had the innovative idea of being white. It's Friday! If you're in San Francisco and you weren't invited to the big dance, why not come see Della Watson and Jessica Wickens at the Canessa Park Reading Series in San Francisco? They'll be joined by fellow Bay Area poet Valerie Witte. The fun starts at 7:30. If you've never seen Jessica and Della read, then you're missing out. When they read together, they bring amazing poetry as well as crazy surprises like overhead projectors and Polaroid cameras. It's like if you combined the heart of the Frogtown Hollow Jubilee Jug Band with the showmanship of the Riverbottom Nightmare Band. 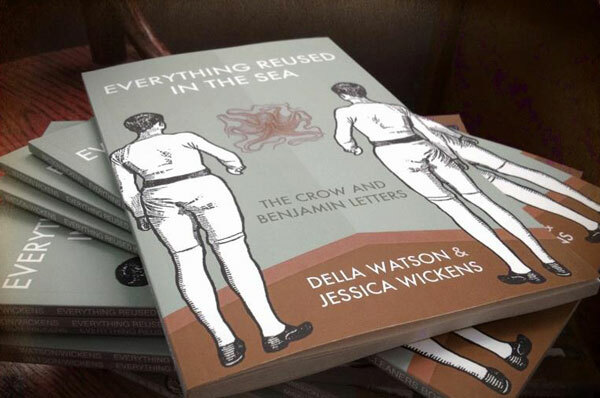 Of course Jessica and Della will be selling copies of their new book, Everything Reused in the Sea: The Crow and Benjamin Letters, which is available right now at Mission Cleaners Books. Logan Ryan Smith's Bug House is still available too. And since you liked the Emett Otter reference, I'll give you free shipping if you order both books now. If you'd like to know when and where Mission Cleaners Books authors will be reading next, book us on Facebook and itter us on Twitter. By the way, I'm doing a little fundraising drive for the Mend a Heart Foundation. Donate $20 and I'll cowrite a poem with you. It might be fun?